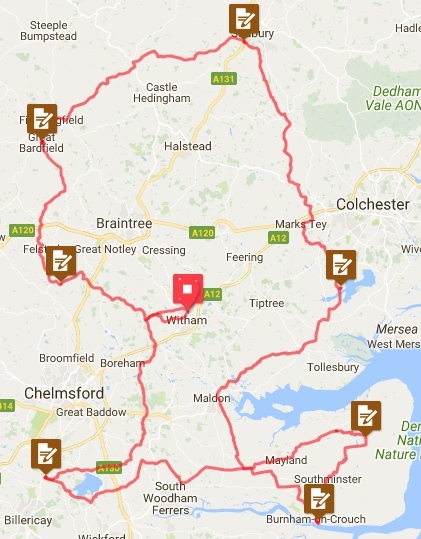 213km cycling event starting from Witham, Essex. Controls at Stock, Burnham-on-Crouch, Tillingham, Sudbury and Great Bardfield. Mainly on quiet Essex B roads and some single track lanes with visits to two reservoirs and a few rivers. Commercial controls and checkpoints. The Essex R&R starts from the Labour Hall with plenty of free car parking and is very close to Witham Railway Station which has frequent services to/from London and Ipswich/Norwich. A light breakfast bar & drinks will be ready to welcome you at the start and also some refreshments at the end included in the entry fee. A gentle leg warm up will bring you to the foot of one of Essex's infamous non-flat bits when you climb North Hill then head off for your first reservoir as you ride around 3 sides of it visiting the old village of Stock. Then it's off to the famous yachting town of Burnham-On-Crouch with some views across the River Crouch to the South. Head out to the quant little village of Tillingham in the Dengie Hundred for some real open countryside. Not an official control but at almost half way the time may be right for a lunch stop in Maldon; it abounds with cafes and pubs. Abberton Reservoir Visitor Centre gives you your second reservoir visit of the ride. Following the River Stour there's a brief interlude in to Suffolk at Sudbury before returning to the best of Essex in picturesque Finchingfield and final pause at the spiritual home of the Audax Club Mid-Essex (ACME) The Compasses Inn at Littley Green.